"This is as much a story about the creation of Biltmore House as it is a window into what it was like to be an American at the turn of the 20th century. Kiernan makes Edith and George Vanderbilt, among the wealthiest Americans at the time, feel like living, breathing human beings navigating life's obstacles in this magnificent book. And she tells the story of how one fiercely devoted woman was able to save the home her husband loved." "The rich have secrets. In her well-researched and captivating book, Denise Kiernan tells the fascinating story of how a phenomenally wealthy Vanderbilt scion transformed a rural North Carolina town by building the ultimate rich man's folly and reveals the eccentricities, heartaches, and even money problems of these Social Register denizens and their friends and employees." "This is a timely and timeless American story of wealth and the responsibility and opportunity it carries. In Kiernan’s hands, this mashup of Downton Abbey-like extravagance set amid the “rugged mountain simplicity” of Appalachia reads like a Southern fairy tale — Brothers Grimm meets Gone with the Wind. A passionately researched family saga of death and divorce, suicide and sickness, fortunes gained and lost, spanning two world wars and set at the crux of the Gilded Age yielding to the modern era, The Last Castle is ultimately a story of fortitude and survival. A stunning and important achievement." "Ms. Kiernan's research is prodigious....she brings the place to life. And she doesn't leave out the juicy bits from the family history: adultery, bankruptcy, suicide." "But reading The Last Castle, the flowing novel-like narrative really is 'about America.' It's about celebrity culture, wealth disparity, the remarkable charity and foresight of a few wealthy people, the urge to create and maintain a family legacy and, in its darker moments, the ever-present potential for personal tragedy. It's grounded in Kiernan's years of globe-trotting research and yet also immediately relevant to the topics that clog social media in 2017." "A story that brings the glitz and glamour of the British royal family to American soil.... Reigning royalty of the Gilded Age, Edith and George Vanderbilt, and their lifetime of financial excess, ruins, scandal, and perseverance come alive on these pages. "A story that is both intimate and sweeping." "The many diverting detours Kiernan takes make the book enticing for even those who will never set foot on Biltmore grounds." 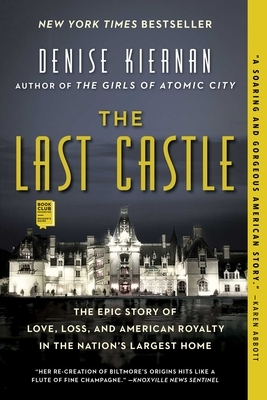 Kiernan evokes the grandeur of Biltmore House...the starring character in this fascinating look at the creation of the largest private home built in the United States. "Denise Kiernan’s book offers an entertaining and meticulously researched glimpse into faded grandeur.... The Last Castle will appeal to audiences who delighted in Downton Abbey and who look forward to its creator Julian Fellowes’s new series—aptly titled The Gilded Age."